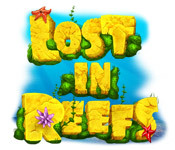 Lost in Reefs is rated 3.6 out of 5 by 19. Rated 5 out of 5 by tutortime from Loved it! I love this series. Its nice to take a break from the other more traditional BF games and play this game. I am always sad when I finish building the city. Rated 5 out of 5 by BlackWaterRules from GREAT GAME FOR THE MONEY This match 3 is a lot of fun, brilliantly designed, with soothing music and a lot of play for the money. There are 3 classes of items to match: tools, treasures, and sea creatures. It is a lot of fun and can be very challenging. Rated 5 out of 5 by jimlur from Does this game end? I'm on level 497 and have over 300,000 points and have purchased everything but the game keeps going??? Rated 4 out of 5 by campingramps from Nice "Lost in..." game When the opening came up and I saw who it was by, I knew I'd like it. I have the Lost in Night by this company and I love it. This game didn't disappoint. 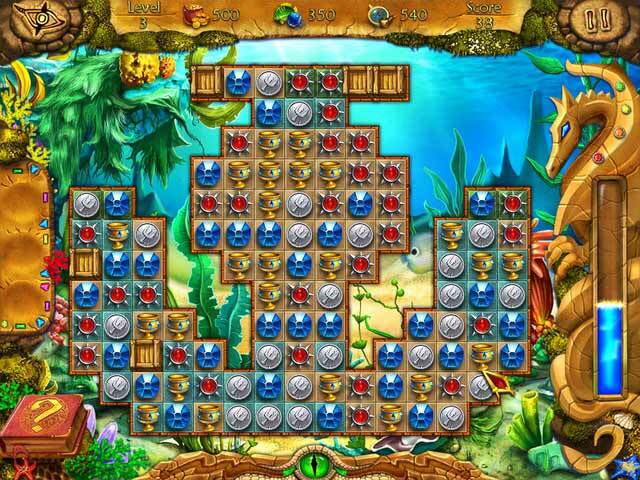 You have 3 different ways to solve the match puzzles, group, swap and chain. Goes pretty fast and you eventually by structures for your town and, I guess, fish. Graphics are good but could be tweaked a little and music was great. This is a good leisure game and great way to just have fun. I recommend this one. Only reason this didn't get 5 stars was the graphics not up to par. 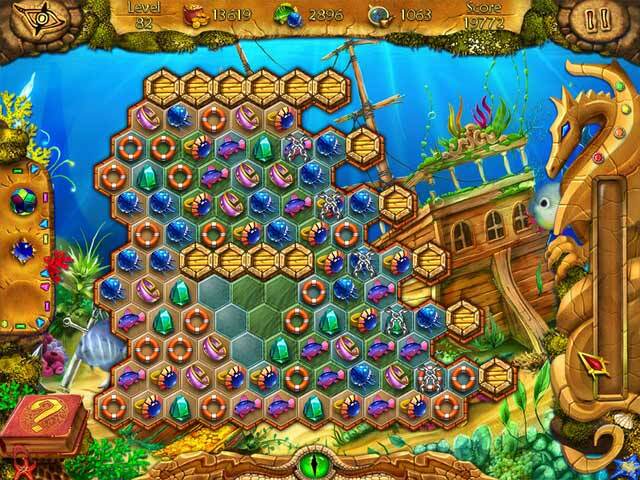 Rated 4 out of 5 by pennmom36 from Lost In Reefs Great Match 3 game with challenging levels and several styles to choose from, and the graphics are beautiful. You can play in Relaxed or Timed mode, in Swap mode, Group mode or Chain modes, AND you can choose the grid style of regular squares, hexagonal or a mixture! The goal is to break all marbled tiles, and as you progress, there are tiles blocked with boxes, stone, chains and walls. Once you have filled the Dragon's Eye with matches, you will receive a bonus. There are several bonuses, a Hammer to break a single tile, a Bomb to destroy a group of tiles, a Mixer to reshuffle the tiles, Fluids to explode 25 random tiles, Row, Column and Cross exploders to destroy tiles in rows, columns or both, a Magnet removes all of the same type of tile, an Hour Glass fills the time meter and a Plus Sign connects two different types of tiles in the chained mode. Some tiles give you resources which are needed to build the ancient city. With each building you build, more resources of a specific kind are earned. This game reminds me of the Cradle of Rome series because the boards and features are similar, enjoy! Rated 4 out of 5 by hawkpaul from Good to start with I really enjoyed this game although it was very slow getting enough to make the buildings. However, suddenly I couldn't play a simple match 3 swap anymore and it insisted I change my mode of play to either chain or group. Group is incredibly boring and Chain is amazingly frustrating so I ended up not be able to finish the game. If it hadn't been for this forced change I'd still be playing it now. Bad choice by the developers. Rated 4 out of 5 by fredandethel from my favourite chain match game I bought this game because of the choice of swap, chain, or blocks. I was a bit frustrated by the difficulty in getting the right balance of gold, tools and fish to build anything but I did eventually find out what the end of the game was. (Pretty, but it takes work to get there). Block matching was never my thing, for swap matching I have other favourites, but for chain matching I still find this the best. Rated 4 out of 5 by smilesmiley from Mindless fun! If you like to lose yourself in a game, this one is the one. It is definitely one of those games that you can't believe you are playing because it is so repetitive but you just can't stop playing, If there was a 'maybe' recommending the game, I would choose that. It really depends on the person. 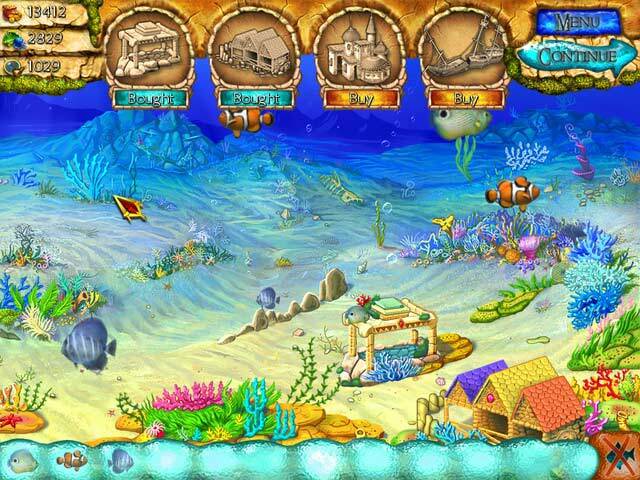 Engage in the creation and exploration of an ancient and forgotten undersea civilization in Lost in Reefs!